Our dehydrated macaroni and cheese is the perfect meal or side dish in a can. Macaroni and cheese is perfect for feeding those small hungry mouths. It is also perfect for adults too. Macaroni and cheese is great because you can also add your favorite ingredients to it to make it your own. This is great to have on hand because it is something that your family will just love and it will save you time. This is a delicious addition to your long term food storage! Ingredients: Macaroni (made with 100% durum wheat semolina, enriched with riboflavin, thiamine, niacin, iron), Cheese sauce (dehydrated blend of whey, corn and wheat starches-modified, cheddar cheese (pasteurized milk, salt, annatto extract, cheese culture, enzymes), partially hydrogenated soybean oil, salt, nonfat milk, natural and artificial flavors, lactic acid, disodium phosphate, yellow 5, yellow 5 lake, yellow 6, yellow 6 lake). 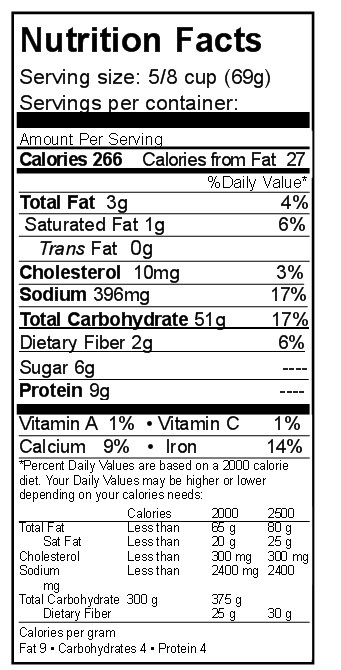 *Contains less than 2% silicon dioxide as an anti-caking agent and less than 2% disodium phosphate as a processing aid. Packaged in a plant that handles milk, wheat, eggs, soy, and treet nut products. Macaroni and Cheese is a household favorite to both kids and adults alike. Macaroni and cheese is good to make by itself and add your favorite ingredients to it, like bacon; or you can add your favorite bread crumbs to it to add a layer of texture. This is a favorite by itself or you can have it for a side dish. This is a delicious addition to your food storage staples. Shelf Life: Should be stored in cool dark place- optimum condition is 60 degrees or less- for longer storage. Storing properly in our enameled cans product may store 15-20 years. Directions: To 3 cups boiling water add 1 ½ cups pasta. Boil briskly for 7 minutes until macaroni is tender. Drain. Add ½ cup cheese blend and stir until smooth. For richer creamer flavor, add ¼ cup butter or margarine and ¼ cup milk. **Try adding dehydrated butter 1-2 tbs. and 3 tbs. milk powder and increase water by ¼ cup.